Good morning! We are back in Idaho, and the wedding was just beautiful. And in my completely unbiased opinion, my daughter was basically the cutest flower girl ever. That’s my nephew with her. 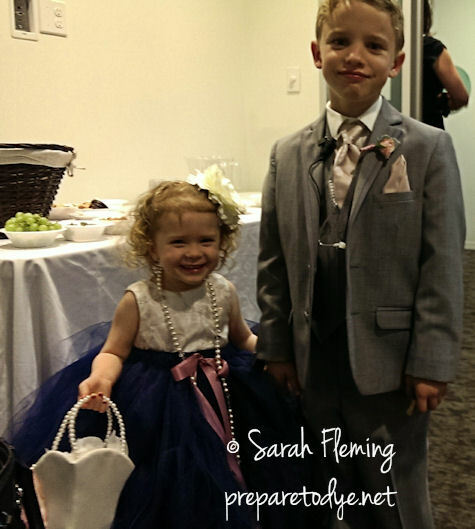 The cutest and most charming ring bearer ever. He wore an earpiece and dark sunglasses and carried a briefcase. Very serious business, the ring bearing. Hahaha. And my daughter threw her flower petals most vehemently. Get thee out of my basket. When she got to the stage, she walked up, said, “There’s petals on my skirt, and I can’t get them off!” Tried to get them off, then realized she was still holding the basket, which was now most unnecessary, and chucked it hard to the floor at her feet. Then she walked back down the steps and back up the aisle. I, in my toe-murdering clearance shoes, skittered up the side aisle and got to the lobby just in time to see the bride’s surprise at seeing the flower girl again. I told her she needed to go stand next to Aunt J while Aunt M came in, so she ran back up the aisle and stood with Aunt J. But then she got bored, came down in front of the stage, and twirled a couple of times. So I just motioned her to come to me. BC danced her face off at the reception with my cousins’ kids (a whole dance floor JUST FOR MEEEEEEEE) until she finally crawled up onto her Daddy and fell asleep. Traveling home was better than traveling to Texas. It got a little dicey getting our luggage from the shuttle to the check-in counter, and at one point a TSA agent was pushing a stroller and another passenger was pushing a suitcase, but we worked it out. We had three flights but no plane changes (I’m SO looking forward to the end of the stupid Wright Amendment in October so Southwest can actually have nonstop flights out of Dallas). And mercifully, no one dumped out our car seat all over the airport. 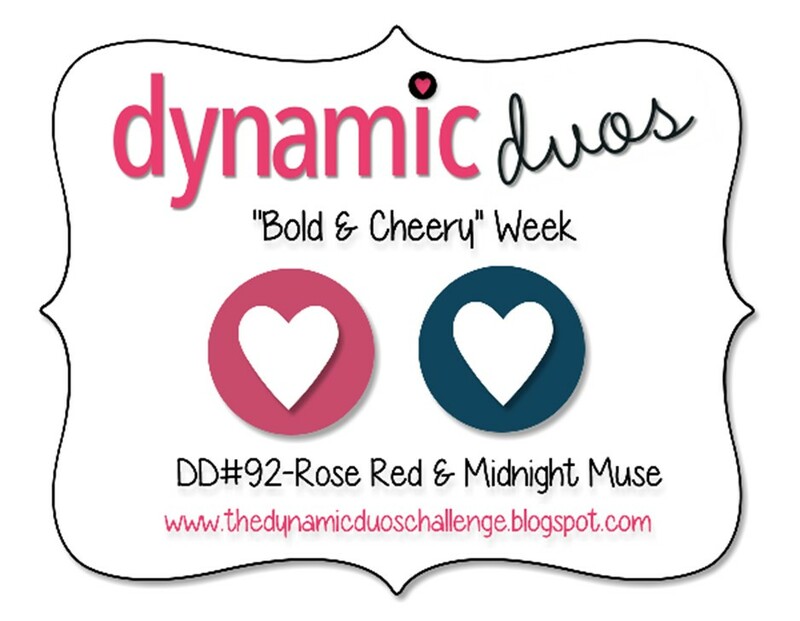 Our challenge colors this week at Dynamic Duos are Rose Red and Midnight Muse, really close to the colors of the wedding last week. 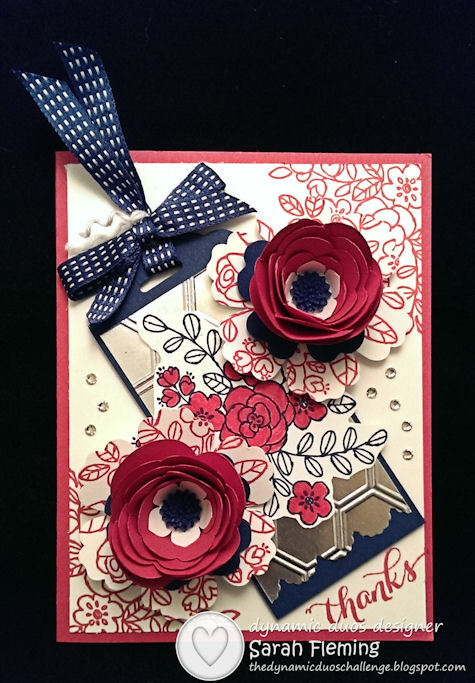 I stamped the smaller flowers from So Very Grateful in the two corners in Rose Red. On top of the white mat layer, I added the tag (more on that later). I stamped the big flowers in Midnight Muse and colored the flower parts (not the leaves) in with the Rose Red marker, then fussy-cut them with my Paper Snips and glued those down to the tag. I was trying to keep all the flowers on one diagonal, so I lined it up with the flowers in the corners. I made two little roses using the Spiral Flower Bigz die, and I will tell you, it’s hard to get the flowers folded to the same size! But I’m sure with practice, I could do it. For the inside of each flower, I punched out a Whisper White flower using the Petite Petals punch, glued that in the center, and then put an In Color Dahlia (in Midnight Muse) in the center of each flower with a Glue Dot. I glued each rose to a Midnight Muse flower punched out with the Pansy punch. Then I stamped the big flowers from the stamp set in Rose Red twice and punched those out with the Blossom punch. I glued the rose/pansy combos to the Blossom flowers, then added those to the card using tape runner adhesive and Dimensionals. I put tape runner on the parts that attached to the tag, then double- and triple-stacked Dimensionals for the parts of the flowers that attached to the card mat. I made the tag using the Scalloped Tag Topper punch. I have a hard time not using this punch on every card! I love it. I need to get the Angled Tag Topper punch, too. I cut a piece of Silver Foil Sheets to add some extra texture and dimension, then trimmed the end of that with one of the Adorning Accents Edgelits and embossed it using the Honeycomb folder. The sentiment is from the photopolymer set Another Thank You. I didn’t use my Stamp-a-ma-jig, because with the photopolymer stamps, you can see exactly where you’re stamping. I hope you like my card. I’ll need to make a box for it using the Envelope Punch Board so I can give it to someone — this one won’t go into an envelope or through the mail. 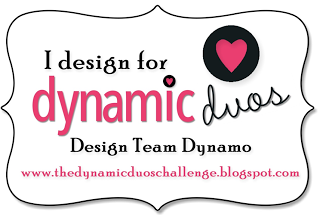 Head over to the Dynamic Duos blog and see the wonderful creations the other designers have made! And please play along! I think your card might have been inspired by the cutest flower girl EVAH! It certainly is gorgeous. Flirty and pretty with a will of steel! (the silver embossed panel). How you have time to get a card done is beyond me, Lady! This is such a great display of flowers and colors this week. Rest up after that big trip! Your daughter is so cute…now, remember that during those strong willed times….lol! Sarah, such an elegant card. Love the flowers and the tag. The layout is great! It’s a master piece! And your kidos are darn cute too! Your card is so pretty. Love the rolled roses and your pretty tag. I agree, your daughter is the cutest flower girl.